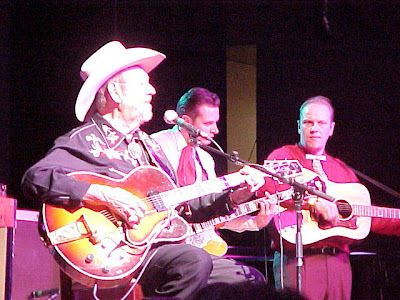 One of my favorite performers, country music legend Hank Thompson has passed away at the age of 82. In the 1950s, Thompson and his band, the Brazos Valley Boys had 21 songs in the top twenty of the music charts -- five of those top ten hits. In '52 Thompson's "The Wild Side of Life" was the #1 country song -- and inspired Kitty Well's "answer" song, "It Wasn't God Who Made Honky Tonk Angels" -- a classic in its own right. All in all he sold over 60 million records and scored 29 top ten country hits from 1948 to 1975. The Brazos Valley Boys were ranked the top country band from '53 to '65 -- a record yet to be broken. He was touring up until a few months ago -- and I was lucky to have seen him at Green Bay two summers ago. The pic here is one I took at that performance. So long, Hank -- we'll miss you. What a bummer. I'm going to listen to Hank today while I get healed. Is that Wayne Hancock on the right? oops! wrong post. I meant to post on the youtube videos... Hank Thompson's death is actually a huge downer. yeesh.